The football season has ended early for Nene and Houssine Kharja, the two players who started last week’s brawl during the Qatar Stars Cup semi-final between Al-Gharafa and Al-Arabi. According to local sports channel Al Kass, the Qatar Football Association’s Discipline Committee has meted out hefty fines and long suspensions for the duo, as well as several other team members involved in the scuffle. The fight occurred last Tuesday night after Nene began arguing with the referee over receiving his second yellow card of the game. 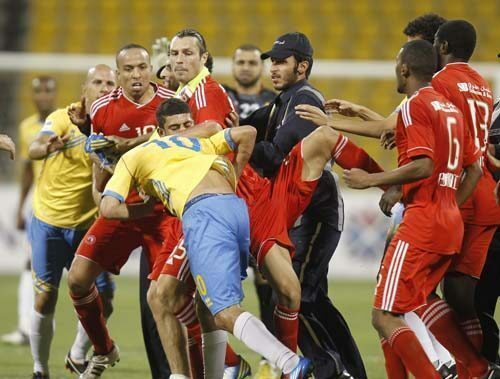 According to a video report, Kharja attempted to intervene by pushing Nene with his shoulder. Nene then punched his competitor in the side of the head, prompting players from both teams to enter the fray. Shortly after, Kharja delivers a flying karate kick into Nene. Nene, a former Paris Saint Germain winger who signed a $14.7 million contract to play for Al Gharafa in January, will be suspended for nine matches and fined $96,000 (QR350,000). Kharja, an Al-Arabi midfielder, will not be allowed to play for 10 matches and faces a fine of $104,000 (QR380,000), Al-Kass reports. Three other Al-Arabi players have also been disciplined. Abdullah Marafee will not play for five matches and has been fined $13,700 (QR50,000) for physically assaulting an opponent; Abdulaziz Hatem has been suspended for three matches and must pay $8,240 (QR30,000) for entering the locker room of the Al-Gharafa team in an attempt to assault them; and Mohammed Al Kuwari who will not play in two matches and has been fined $5,500 for joining the brawl and for also trying to assault his rivals (QR20,000). Additionally, the administrative officer of the Al-Arabi Sports Club, Khalifa Hashim, was given a warning and fined $8,240 (QR30,000) for not abiding by sportsmanship rules and the concept of fair competition, Al Arab reports. Finally, Al-Arabi was fined QR10,000 for receiving more than five yellow cards and for having so many players suspended in such a “shameful” match, the newspaper added. In a statement to Al Kass, the chairman of the Discipline Committee said that the sanctions imposed on the players are an important lesson for them to understand that sportsmanship and clean play are critical while playing football. He also added that he hopes his message will spread through the football community so that such “unfortunate” scenes do not happen again. Both football teams have protested the suspensions and fines and are negotiating with QFA’s Discipline Committee to reduce them. In a statement on its website, Al Gharafa said it was “surprised” by the “exaggerated” discipline and is working on an appeal.